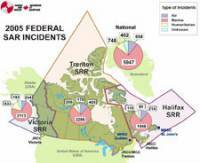 The 2005 Annual Report on the Canadian Search and Rescue Program has been published by the Interdepartmental Committee on SAR. According to the Report, the Joint Rescue Coordination Centres (JRCCs) responded to 8,015 incidents in 2005, of which 5,947 or 74% were marine-related SAR incidents. The Canadian Coast Guard Auxiliary responded to 1,531 distress calls and provided 17,910 volunteer hours. While the incidents varied in severity, approximately 28,000 persons received some form of assistance from the SAR system.